Manufactured Need is a concept that gets kicked around a lot in think tanks, shopped among market analysts and business psychologists. Simply stated, it’s a comment on the suggestibility of the public at large to the creation of new states of desire. The same principle exists and operates in the stock market, both at home and abroad. Market Sentiment. It’s a small phrase, but sentiment demonstrably impacts the market at large. Sentiment determines the relative importance of pivot points, informs the impact of secondary market projections, and its codification and consideration constitutes a notable portion of market analysis. 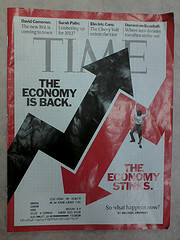 Stock market sentiment has been weighing heavily on the public consciousness in the U.S. since the beginning of the United States’ financial woes in 2008, and the circular nature of the beast combined with the deep entanglement has created a certain malaise overhanging even the idea of the market’s operation. The bearish and bullish leanings of the market from day to day are part of a broader trend that both influences and is influenced by world events, price history, and a variety of additional technical and essential factors. Market sentiment informs a global culture of speculation. The recent Grecian concerns have caused a wildfire anticipatory fervor in worldwide finance, with many investors fearing that damage to the European economy could bring about unfortunate consequences for the world market. Bloomberg’s reporters covered the issue of anticipatory speculation in their article on the recent cessation of the Indian market’s bounce back after initial losses in the wake of EU hearings on a bailout for economically troubled Greece. After India’s long bullish streak, its index’s meteoric rise from 2,100 to 29,000 points between 2003 and 2008, investor confidence is high and market sentiment charts remain decidedly growth-confident. Analysts, however, are scrambling to map upsets like the one in Greece to current projections. The increasing interconnectedness of the world market has made generation of reliable stock market sentiment charts an ever more difficult challenge. Accumulation of data, accurate assessment of less tangible factors like the general political climate throughout economically key areas and spheres of influence, and the inherently hyper-quick nature of change in the market has left market analysts fumbling for new tools to use in assessing the price-trending of the market as a whole. Phone canvassing, internet surveys, investor confidence reports are all part of the multi-billion dollar market data distribution business. Moreover, they’re part of an increasing effort by market analysts and data distributors to effectively centralize all relevant market knowledge into ideal codebooks to the market’s mood. Providing sentiment charts rapidly and accurately is a significant business within the larger fiduciary community, where the need for quick summaries of general feeling and market confidence (or lack thereof) is high. Providers of sentiment charts include major research trusts like Market Harmonics and StockCharts.com, to say nothing of colossi like Bloomberg who trade in data on a massive scale. Market sentiment is currently rallying following heartening news from China and the Asian market. For the first time in four months, the Yuan has risen in value, breaking a long period of stagnation in the Chinese currency’s market impact. As the global market continues to develop as an increasingly interconnected web of fiduciary and political interests, investments, speculations and trans-global regulation, market sentiment assessment must correspondingly become an ever more important tools for financial professionals everywhere.